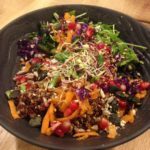 A fabulous salad perfect for detoxing, that makes use of winter veggies and fruit, mixed with quinoa for added protein. Make a big bowl and eat over a couple of days. Once detox is over you can jazz it up with some goat's cheese, or salmon. Put the quinoa on to boil with twice its volume of water. After around 10 minutes the quinoa should be soft but not slushy. Put a lid on the pan and allow the quinoa to dry in its own steam. allow to cool. Wash and chop the kale leaves finely and add to a bowl with the lemon juice for around 15 minutes to soften them. if using other salad leaves, chop or tear into fine shreds- cabbage also works well. Add the lemon juice to the salad dressing step. Spiralise (or use a vegetable peeler) the carrots, and chop into lengths of around 3-4 cms. Peel and slice the orange into rounds, cutting them in half again. Once the quinoa has cooled assemble all the above ingredients with the quinoa, the pomegrnate seeds and the red cabbage. Mix everything well. Blitz all the dressing ingredients together to give a smooth dressing. Add more water to get desired consistency. Pour the dressing over the salad and mix well. Top with walnuts or pumpkin seeds, and some fresh sprouts.